This book left me reeling, but in a good way. Errr… can one reel… positively? Ahhhh, no matter, my brain is in stun-mode, ’cause this one’s a stunner. It’s devastating, brilliant, and clever! Both amusing and agonizing and just so realistic. It touches on a plethora of emotions and thoughts that I wholeheartedly connected to, leaving me at times touched, and at times appalled at the revelations as each piece of the puzzle was discovered and snapped into place. Right? RIGHT!!??? OMG I HAD to read it ASAP! Maryse’s Book Blog: Here’s what I’m reading right now and I’m thoroughly enjoying it. What!? What is the husband’s secret!?? GAH! Wait! Don’t tell me. 😉 The book has been weaving me in and out of each of the character’s lives (all intertwined) and each story is so compelling, and yet, this “secret” remains a mystery and continues to haunt me. I’m scared (and titillated). Eeeep! Mandie: read this last week. AMAZING! Also What Alice Forgot (same author) is great too. Katherine: Ok..u sold me..gonna get it. Sadie: Yay! Love this author. What Alice Forgot is one of my faves, and the Hypnotist’s Love Story is good too. This one is high on my TBR! Rayni: Everything written by Liane Moriarty is AMAZING!! Three Wishes and What Alice Forgot are favorite books of mine. 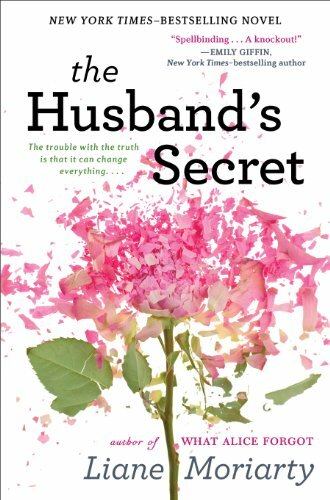 Have to get back to The Husband’s Secret soon. Sarah: Just finished this book last night..I really liked it! Twists and turns and was interesting to see how the lives of all the characters were intertwined! Serious drama yes (certainly a life changing secret or two being harbored), but so thoughtfully executed. The subject matter, reactions and decisions are at times, as intense as some of our super-angsty reads, but it’s narrated in a manner, uncovered in a way, that never exhausted me. It’s sophisticated and sane, even in it’s moments of insanity. Sure… there were a few possibilities that I had been contemplating along the way (that may or may not have surprised me when finally exposed 😉 ). Hints (both personal and factual) that I easily forgot amidst the turmoil and angst of these character’s lives, but that could mean a ton, in the grand scheme of things. While there are numerous small bumps and bruises as we cruise along, the band-aided fissures eventually gape wide open, and some things come full circle. Those mental “band-aids” (compartmentalizing) can only hold for so long, you see. I deserved nothing and I got everything. It’s about separate lives, separate couples, separate families that are all somehow… intertwined. Some of them know each other well, and yet, some are mostly… unfamiliar. Practically strangers. Wrapped up in their own worlds, but so surely connected on a deeper level. Certain events and decisions have linked them. It’s a touch convoluted, ’cause there are many characters and they are all important, but you’ll get the hang of it in no time, and it is sure worth the *slight* effort of keeping track. You’ll find yourself switching back and forth from one set of characters, to another, and yet to another set again, but you’ll be equally invested in every one of them. Each one has it’s own OMG-factor. I kid you not. From the “perfect” wife and her perfect handsome husband, and their fairly perfect trio of daughters, bustling about their perfect facsimile of a life (and believing it… believing it themselves) until she finds a strange letter from him – to her – to be opened only AFTER his death (but she finds it while he’s still alive and on a business trip). “It’s not a big deal, but Cecilia, please, I’m asking you not to open it.” He sounded quite desperate. To the handsome P.E. teacher at a primary school that has his own personal enemy (unbeknownst to him). Him. She flinched and took a deep breath in through her nostrils, as if at the sight of a furry black spider, not a perfectly plain looking man. It was a joke. She couldn’t stop thinking that the whole thing was a terrible joke. To the elderly lady who’s been dead inside for decades due to a tragic loss, and is faced with yet another potential loss that threatens to break her completely. She had no idea that her life was so flimsily constructed, like a house of cards, and that Rob and Lauren could march in here on a Monday night and cheerfully help themselves to the one card that mattered. Remove the Jacob card and her life collapsed, floated softly to the ground. Whoa. Seriously a book to be experienced in whole. It’s heartwarming, and moving and often disconcerting. I questioned my sanity a few times, for sure. But, you see, I was them. I was all of them, as they questioned their sanity, too. Her goodness had limits. She could have easily gone her whole life without knowing those limits, but now she knew exactly where they lay. Sure, this is not my usual read, ’cause it’s not full-on romance, or even a deeply focused love story (HEA or not). However, it does involve numerous love stories, but… more of a realistic exploration of them (setting aside the crazy secret, of course). From a look into unconditional love. Complacent love. Romantic love. The love of family. The perfect life (or the perfect facsimile of the perfect life). Resentments. Regrets. Tragedies and loss. She wanted nothing to do with his grief. She didn’t want to know about it, or feel it, or share it. Hers was bad enough. How could she cope with carrying his as well? Triumphs. Revenge. Consequences. Life changing secrets. Life changing decisions, and how our choices (good or bad) can come back to haunt us (again… in good and bad ways). The “butterfly effect” and… even more than that. Ohhhhh just you wait. When a fellow reader told me “best epilogue ever” she wasn’t kidding. That cinched my 5-star rating for sure (despite the fact that the original storyline, and wonderful writing had already guaranteed it). *Whoooo* you guys. Do yourselves a favor and enrich your reading experience with this one. You might not come out of it “in love”, but you will come out of it enlightened, and a little delighted. HEA? Maybe some. Maybe all. Maybe none? You know my lips are sealed! 😉 No matter what… so worth it. I promise! She’d wanted the wave of clean, beautiful emotion you felt when you saw a heart-swelling movie scene with a magnificent sound track. She hadn’t wanted anything that would actually hurt. Ohhhh how I can relate (even just, as a “reader”). Off I go to explore more of this author’s repertoire! Yessss! Can’t wait to dig in!! This got me excited. Her other books i’ve read feel exactly how you describe this one. She is an author where I will always try it, no matter the book’s blurb. Thanks! Yess!! 5 stars for me too! This author is so good, I just finished reading “What Alice Forgot”, amazing! You always seem to mention a book right after I find it for the first time.I saw this one on the Kobo website and it had me intrigued.Now I know I need it!